But now it is time to get back in business, therefore I prepared for you the first outfit of 2018. I must tell you right from the beginning that I love the simplicity and chicness of this look and I could not have found a better one to show you at the beginning of this new year. A pleated skirt is a must in your wardrobe regardless of the color you choose. I didn't have a burgundy one until now and since I think that this color is perfect for winter, it went immediately in my shopping cart. :) The color is gorgeous and fabric is a little bit shiny, fact which makes it suitable for both elegant and more casual looks. I wanted to make this an outfit which can be worn during the day, therefore I dressed it down with a big, chunky SWEATER which I can't even begin to tell you how soft and warm it is. Seriously, it is even thicker and better than I imagined! 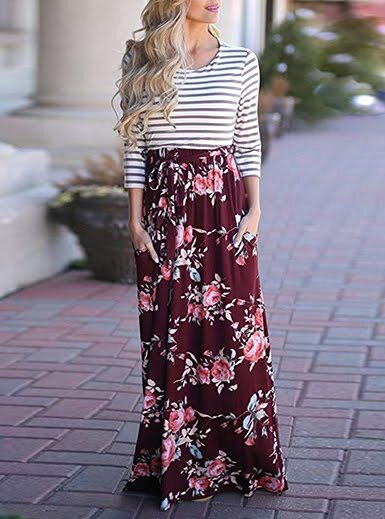 I like the pattern and the off-white color and I totally love how the sweater looks with this skirt, but you can of course wear it with jeans, pants, etc as well. And if you want to wear the skirt in a more elegant way, you can choose a shirt or blouse and a pair of court shoes. Finally, I completed this look by adding my new pink bag which goes perfectly with the rest of the outfit and it even creates that sort of contrast that I love. The bag is covered in corduroy fabric and I like the golden chain and front detail, but most of all I love the little bow detail which makes it even cuter and the beautiful shade of pink it has :). Once again, I wish you all a happy new year, lots of love, health, accomplishments and fulfilled dreams! Ich wünsche dir ebenfalls ein schönes neues Jahr. Das Outfit sieht einfach super schön aus. Ich liebe Faltenröcke und gemeinsam mit dem Pullover ist es ein toller Look. Steht dir super. Genau mein Geschmack. Love your pleated skirt. Such a nice way to style it with a cozy sweater for the winter!